When you are on vacation in Puerto Vallarta, a great way to enjoy the area is a swimming with bottlenose dolphins. The Private Dolphin Swim for Groups is ideal for those who want to spend time with family and friends and who have a group of up to 6 individuals. When you partake in a private swim with dolphins, you have the opportunity to customize your experience with the marine creatures, which gives you a unique experience like no other. You can choose for your group to experience a wide range of activities with the bottlenose dolphins, which include the dolphin foot push or the belly ride. 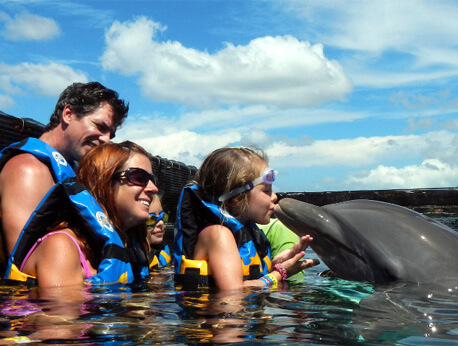 Your group can also experience hugging and kissing the marine animals. If you want a personalized experience with the bottlenose dolphins, then the Private Dolphin Swim for Groups is perfect for you and your group. The Private Dolphin Swim for Groups provides you with an experienced dolphin trainer and takes place in the crystal clear waters at the Nuevo Vallarta Dolphin Center, which is known as one of the best dolphin facilities in Mexico. There is also a group of talented photographers on site to take pictures of your experience with the dolphins that you can purchase after your interaction with the marine mammals. The Private Dolphin Swim for Groups is available 7 days a week and will last 30 minutes. Aside from a private swim encounter with the dolphins, the tour also includes an orientation with an expert trainer, a towel, and a life jacket. The cost of the tour is $849.00. Children who are under the age of 10 must be accompanied by an adult. Personal cameras are not allowed in the observation area or pools, to ensures the safety of the dolphins. When you are on vacation in Puerto Vallarta, the Private Dolphin Swim for Groups is a wonderful way to spend time with friends and family while interacting with bottlenose dolphins.